Teach your MAKERBuino how to talk! It’s a small PCB with a couple of ICs and they provide enough space to house 1016 different words/sound bites Every word is spoken by a female voice with an English accent. Thank you for sharing, I just backed the project too! The Little Buddy Talker might be better (more compatible) with the MakerBuino - sure it’s limited to 254 words - but there are still a number of things that can be said. I did write a easier to use library for the 100+ Word Shield and Little Buddy Talker (LBT) and plan on porting it over to the BBT (Big Buddy Talker) Which from my understanding does work a little different than the previous two products. Although since you will probably have to use some port expansion, I doubt it would work with the library I have written. I have some videos of the LBT with a Raspberry PI and ESP8266 (Being used as a clock). So it is really easy to use (even without the library). I ran into a problem I don’t know if it’s a memory issue or a library issue or hardware issue. IF I try to include the gamebuino library, and then use gb.begin(); in setup - then the LBT doesn’t talk - if I remove the gb.begin() then the lbt works - But of course none of the features of the gamebuino library work. I tried an Adafruit library for the Nokia 5110, which does work - but when I include the Word100 library (or even without the library) - then the screen doesn’t work. It leads me to believe that it might be a hardware issue - The LBT doesn’t have a MISO line, and think when you use a more than one SPI device you need to use the MISO line - I maybe wrong about that, and someone could correct me. I tried for a few hours to get it to work - but finally just gave up. I’m not really sure, but I lean to hardware incompatiablity. The video above is just the Word100 library, and nothing else, works great. It is a little hard to see in the video how you’ve wired it up. It looks like (but I could be wrong) that you’re using I2C_SDA from one of the top connectors. And SCLK and #RESET from the programming connector (the upper two from the top row of pins. Can you give a bit more detail on this? Maybe with pictures? Yes, I was using the I2C header for power and SDA for CS, MOSI (it’s under the SCK pin and you can’t see it well in the video) and SCK from the program header. I think but not sure that to use more than one SPI device you also need the MISO to be used. I have been thinking about making a I2C interface for the device using a Arduino NANO - the nano would be connected to the LBT via SPI and the Makerbuino (or any other microcontroller) would just need to connect via I2C and send command to it - I think this would solve the limitations of only having DI, SC, and CS pins - and if I get time to night I’m going to give it a try and see if that doesn’t work. I’ll post pictures of the above setup later, I’m not really anywhere that I can take pictures right now. I have a working proof of concept for a I2C to SPI interface, I’ve not tried it on the MakerBuino yet - and there are some limitations I didn’t for see, but for the most part it works. 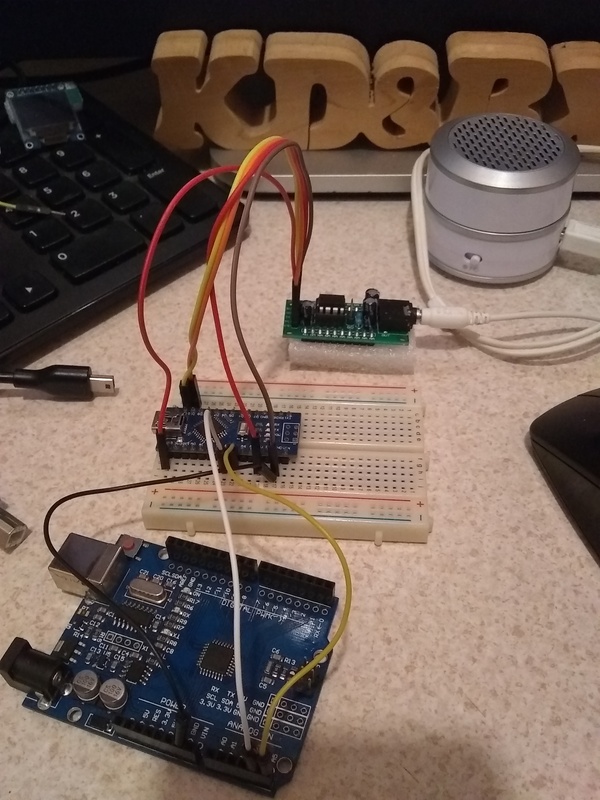 Here I am using an Arduino Nano as a I2C slave, I have the LBT (little buddy talker) connected to it like it should over SPI. The UNO is sending commands over I2C, the nano is running the parts of the library I wrote, and it’s working for the most part. @kd8bxp, welcome to the forum and thank you for supporting MAKERbuino! Thank you, Not sure which shirt I was wearing, I’m guessing my Classic DC super hero shirt…LOL. As promised here is another short video and the code if someone wanted to set this up themselfs. And when I get my BBT I’ll update the code to work with it. I am also planning on turning the code into a full library. Because honestly it’s still a lot messy to look at. BTW: I don’t mind at all if you want to share the code/information project what ever! P.S. I’m wearing a Batman tee today!! LOL… have a good night.